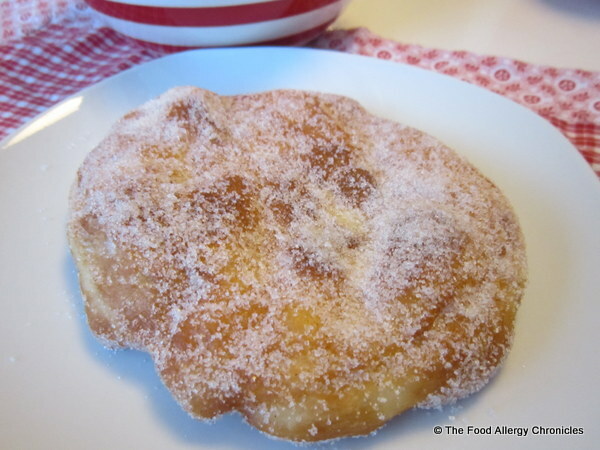 Posted on February 22, 2013 by Susan H.
It nearly broke my heart when my boys were not able to partake in the engorging of Ottawa’s ‘sweet trademark treat’ after skating the Rideau Canal on the last day of Winterlude…The BeaverTail. Although there are no peanut/tree nuts in the actual BeaverTail…the environment that they are made in is not peanut/tree nut free…nor am I sure if they contain any dairy or eggs…therefore, a no-go for my boys. 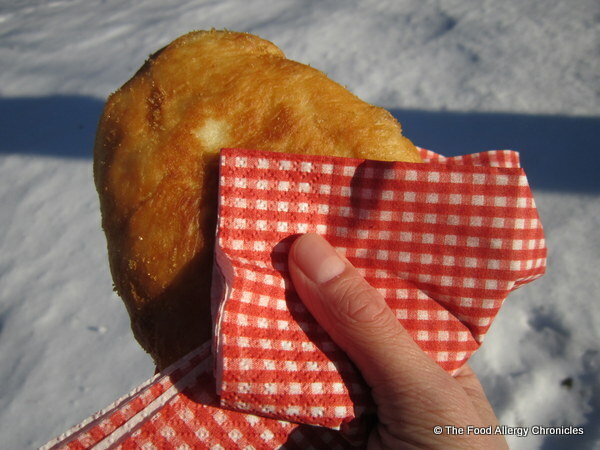 A BeaverTail is basically just fried dough tossed in cinnamon sugar, or squeezed with lemon and sprinkled with sugar or topped with your own inventive favourite. Turns out, it was much easier to adapt than I thought. I found the perfect recipe to adapt at Canadian Free Stuff. Click here for the original recipe. Substituted 1 cup warm Natur-a Soy Beverage or Natur-a Rice Beverage for milk. Substituted 3 tbsp water mixed with 3 tbsp canola oil with 2 tsp baking powder added just before you stir into the liquid ingredients. The boys invited their friends, Victoria and William over to give them a try as they have actually experienced the ‘real deal’. Michael liked them but did find them a bit too sweet to enjoy more than one. Matthew, on the other hand, loved all the sugar and cinnamon…so much so, he was licking it off his plate in between helpings! Victoria and William were quizzed as to whether or not my Dairy, Egg, Soy and Peanut/Tree Nut Free BeaverTails tasted like the ‘Real BeaverTails’ they remembered from their trips to Ottawa. Unfortunately, their recollection was marred by the fact that they have not tasted one in years. Both did agree that mine were pretty darn tasty! 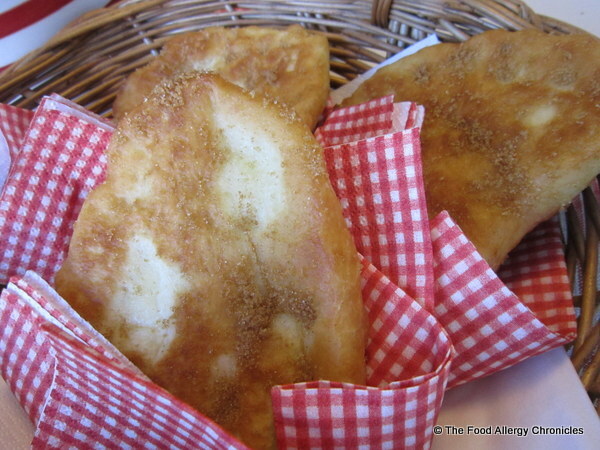 Imagine how awesome it would be on a cold and snowy day when the boys and their friends are outside playing in the snow to call and surprise them all with a basket of hot and tasty Dairy, Egg, Soy and Peanut/Tree Nut Free BeaverTails to munch on outside…just like on the Rideau Canal! Matthew ran down the street with this freshly made basket of Dairy, Egg, Soy and Peanut/Tree Nut Free BeaverTails for our friends down the street to enjoy…and enjoy them they did! Tip 1: I added the 4 cups of unbleached flour to the liquid ingredients and used the remaining 1/4 cup to dust the area I kneaded the dough. Tip 2: I let it rise more than the 30-40 minutes…it was over an hour and everything worked out fine. Tip 3: I used a ratio of 1 cup of granulated sugar to 3/4 tsp of cinnamon…gear it to your tastes. The second time around, I used a ratio of 1/4 cup of Demerara Sugar with 1/4 tsp of cinnamon. Tip 4: There was plenty of dough leftover…I refrigerated the rest of the dough in a plastic container. I let the dough sit at room temperature for about an hour before starting to make the BeaverTails. Tip 5: The boys experimented with drizzling the Dairy, Egg, Soy and Peanut/Tree Nut Free BeaverTails with pure maple syrup…a very decadent Canadian treat! 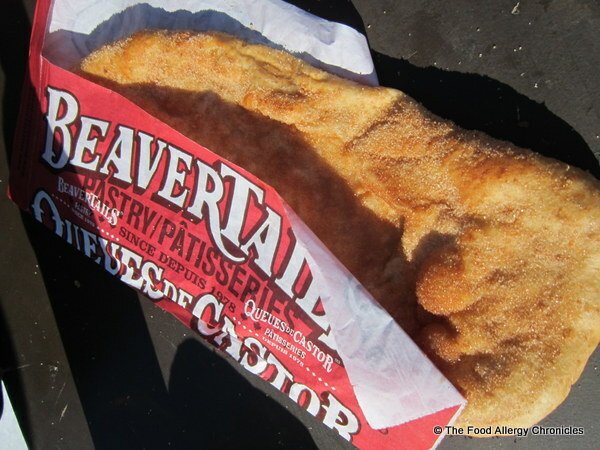 Have you ever experienced ‘The BeaverTail’ on Ottawa’s Rideau Canal or have food allergies kept you from trying one like my boys? This entry was posted in allergies, baking, breads, dairy free, doughnuts, egg free, multiple food allergies, peanut/tree nut free, sesame free, Snacks, soy free and tagged BeaverTail treat from Rideau Canal Ottawa, Dairy Egg Soy and Peanut/Tree Nut Free BeaverTail treat, Natur-a Rice Beverage, Natur-a Soy Beverage by Susan H.. Bookmark the permalink. Oh i’m in LUST!! lol!! I remember those from years back!! Why am I not suprised that they turned out amazing!? 😉 Yum! !